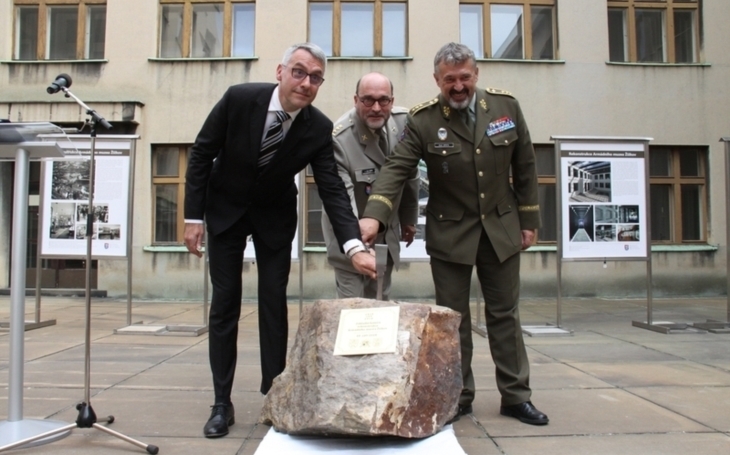 The long awaited and needed reconstruction of the Army Museum in Žižkov, Prague, has started on Monday 10th September by a foundation stone laying ceremony attained by the Minister of Defence Lubomír Metnar, the Chief of General Staff Lieutenant General Aleš Opata, and the Director of the Military History Institute Colonel Aleš Knížek. The museum will offer much larger expositions, not limited to the latest history of the 20th century only. The building has been closed for the public since the last year. It is the first large reconstruction of the museum since it’s establishment in the 20’s and 30’s of the 20th century. „I firmly believe that the visitors will be able to admire a large interactive exposition on military history and the Czech state from the medieval times to our days. The Czech Republic will gain a world class institution,“ Minister of Defence Lubomír Metnar said. The Ministry of Defence played an essential role by supporting the construction of large and modern depositories in the Military Technical Museum in Lešany, which allowed to store the Army Museum’s collections in the most suitable conditions to preserve the objects for future generations. “I would like to remind everyone that the Military History Institute Prague participates largely in formation of modern traditions of the Czech Army’s foreign deployments. Together with the Joint Operations Centre (JOC) of the General Staff it has put through a standardized operation procedure of essential activities of the military history service of the Ministry of Defence within the foreign operations. It collects and processes written and tangible objects and audio-visual materials which document the activities and everyday life of the Czech Army’s servicemen. I believe that in the new exposition of the Army Museum in Žižkov the soldiers of the Czech Army will find encouragement and inspiration for proformance of their duties,“ the Chief of General Staff said. The main aim of the reconstruction of the Army Museum is to enlarge the exposition area of the museum, which is enabled especially by abolishment of the old depositaries, and their replacement with expositions. Also the vestibule of the museum will be roofed, and a brand new entrance with all the visitor background will be established in the basements. Thanks to this the exposition area can be trippled. According to the Director of the Military History Institute the enlargement of the exposition area will allow for a dignified commemoration of those who had fought for our national independence, but also for a complex view of the military history of these lands from the medieval times to the recent foreign deployments of the Czech Army. The museum will offer objects which were stored in depositaries since 2002 (that year the Schwarzenberg Palace, former military museum, was ceded to the National Gallery). “The project of the future Army Museum Žižkov advisedly combines the conservative museology with modern conceptions, with the accent put on the unique exhibits completed with audio-visual elements,” Colonel Knížek said. The Army Museum Žižkov should reopen its gates to the visitory by 2020.